This week, we’re taking to the waves with underwater-inspired kids decor. A constant force in summer, winter, spring and autumn, the ocean provides endless fascinating for growing minds. There is something about the changing tides and the creatures swimming below that captures the imagination of kids. Whales, fish, jellyfish, shells and other delights are popular among all ages and genders, and for good reason, we might add. Who could resist the sights and sounds of the ocean, after all? 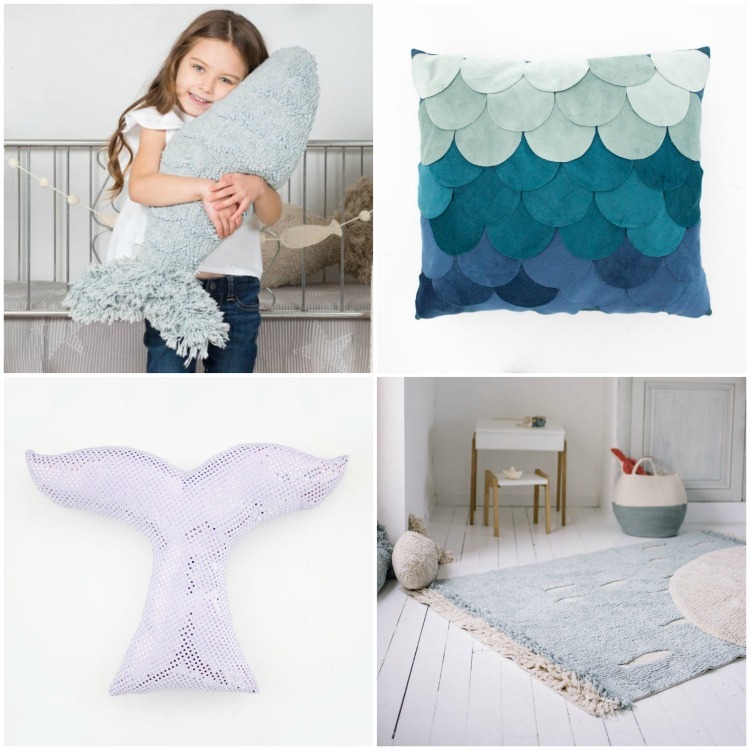 Our featured collection of kids decor is inspired by the ocean and all of its wonders, from the treasures found along the shore all the way to the wonders of the deepest ocean. Keep reading to find out how you can bring a little bit of oceanside magic to your kid’s room. From top left to bottom right, we have a collection of beachy inspired finds that make us think of endless sand, crashing waves and fascinating treasures. First, we have the gorgeous double-sided Waves Baby Blanket from Bunni, which features a sand and white wave pattern that is sure to lull your little one to a peaceful sleep in no time. 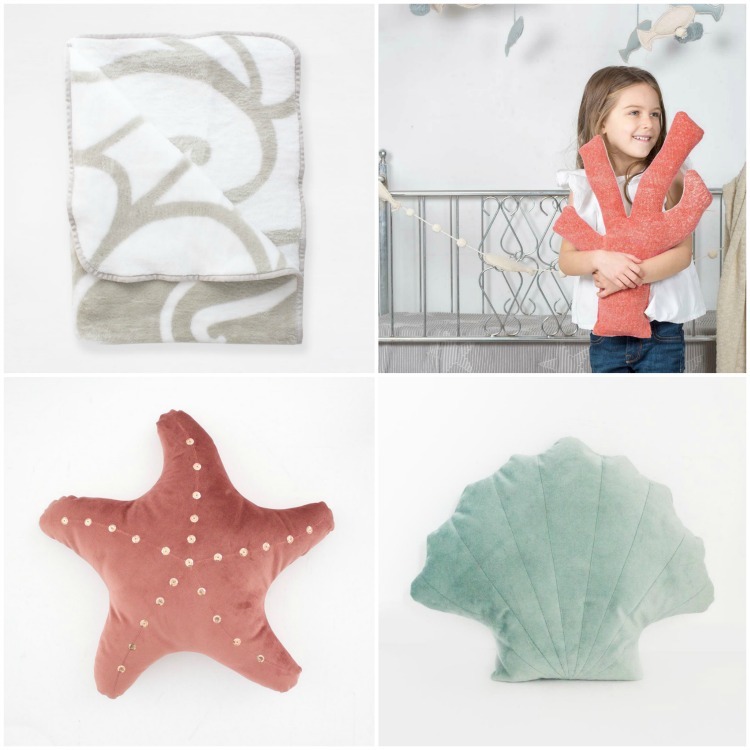 Then, we have the washable Coral Scatter Cushion from Lorena Canals, which pairs perfectly well with the Starfish Scatter and the Clam Scatter, both by Bunni. Made from the softest velvet, these cushions are versatile and fun, pairing well with seafoam, green, blue and neutral bedding. Who can resist the tantalising tentacles of jellyfish? Or the eight-limbed wonder of the octopus? 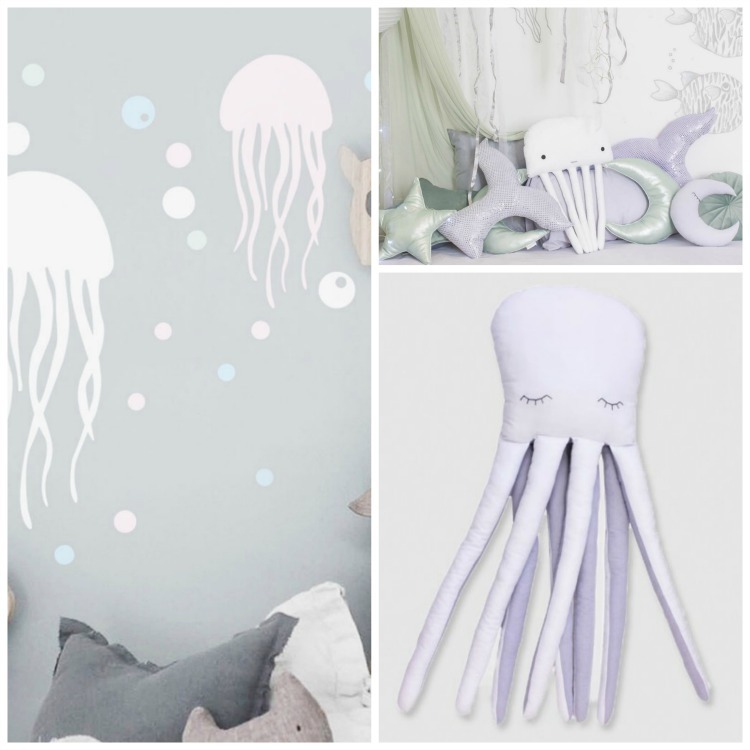 Jellyfish Wall Decals from Bunni will add an instant touch of underwater wonder to any bedroom, while an oh-so-sweet Jellyfish Scatter and an equally adorable Octopus Scatter will add the final touch to your little one’s ocean-inspired bedroom. Both of these scatters are made by Bunni. The jelly is available in white, while the octopus comes in pink and purple. Pair with neutral, white, grey or blue bedding to add even more to this whimsical look. Heading deeper into the ocean, we have a very huggable, fully washable Baby Fish Scatter that is sure to be your little one’s new best friend. This Lorena Canals scatter is available in the calming colours of aqua and natural. These scatters go perfectly with the new Lorena Canals Ocean Shore Rug, which has cut-out fish and an edge that brings to mind waves crashing into shore. This rug can also be easily washed in the machine without the risk of fraying or fading. To add an extra touch, the Whale Tail Scatter by Bunni is available in three colours – grey, icy blue and lilac. The Bunni Fish Scales Pillow continues the aquatic theme, with soft velvet scales in soothing shades of blue and green. Head on over to the Clever Little Monkey store to shop our ocean-inspired kids range today, and find the very best selection of kids decor, bedding, furniture and toys.